Whew! Sorry for the radio silence! It’s been all go here getting to grips with my new Etsy shop and attempting to keep on top of the garden and shearing my sheep. Whilst my days have suddenly got even busier (were that possible) I am enjoying all the new challenges along with the old and the sun is shining and things thriving which always make life easier – even if it does give the weeds in the garden a very unfair advantage!! 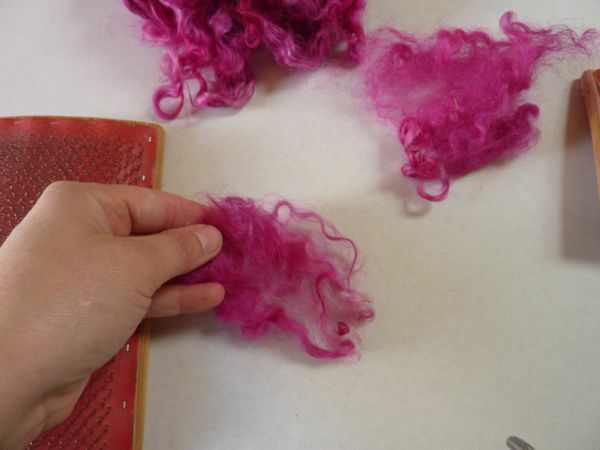 I did want however to put up a post about hand carding wool as I’d promised a few people I would try to do this. I have a confession: hand carding is not my forte. 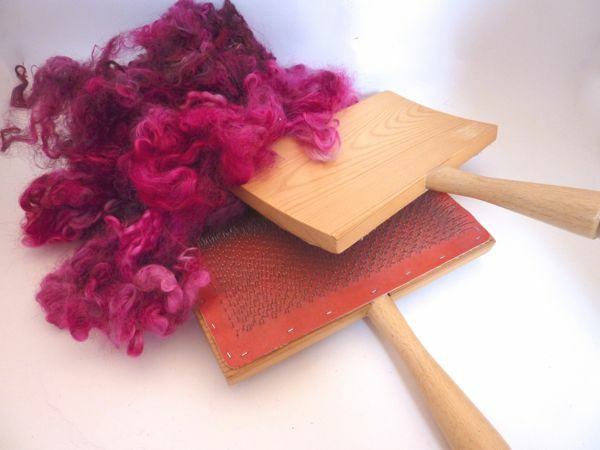 I’ve been spinning and prepping fibre for spinning for 8 years now and right from the off, I struggled with hand carding and shortly after got myself a drumcarder which has been my favourite fibre prep tool ever since. 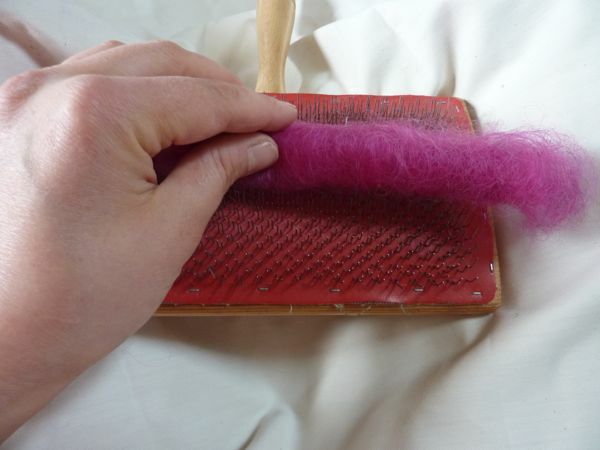 But Hand carding is a good skill to master – it’s quick and simple to prepare fleece, blend up samples or colour changing fibres, it’s essential for true woollen spinning as the airy rolags produced by hand carding are the basic “bricks” of the woollen yarn which is basically a tube of wool with a core of air made by the springyness of carded wool fibres running everywhichway. 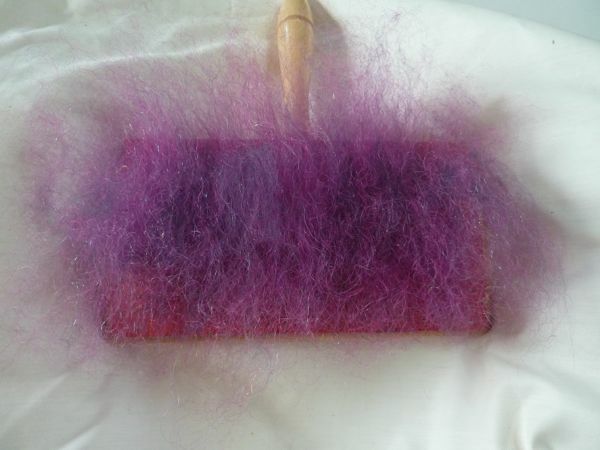 It’s also embarrassing to be competent at spinning and rubbish at hand carding because truly, it’s almost the first thing you show a new spinner before they even touch their spindle or wheel so it doesn’t give a very confident start when teaching if you have to gloss over the making of rolags! 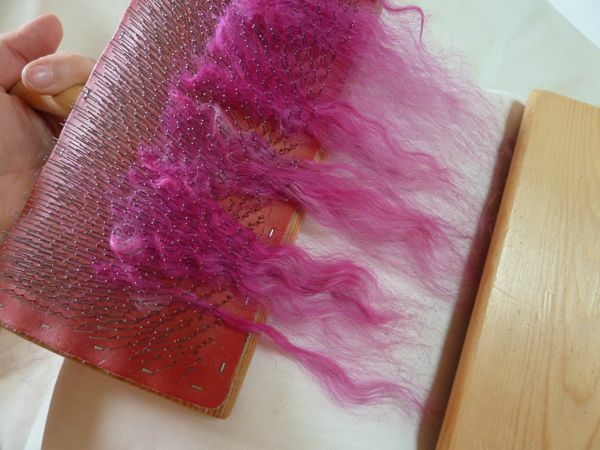 Last year the very lovely Amanda Hannaford from MandaCrafts taught a workshop at our guild on Longdraw Spinning which was thoroughly enjoyable. 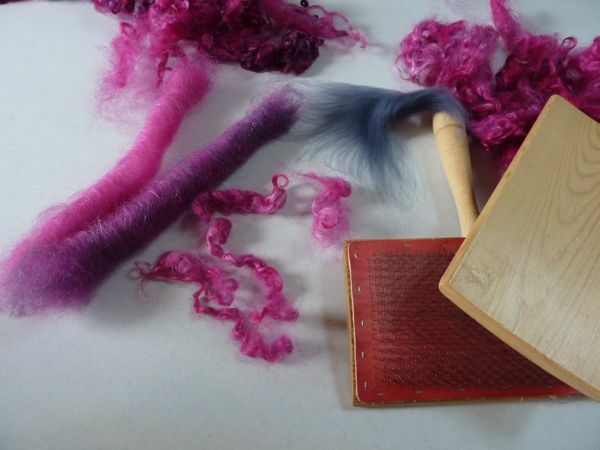 Amanda is a wonderful teacher, patient and clear and super person to talk with and be around – if you are looking for a workshop for your guild or spinning group then I highly recommend her workshops. She is in demand both in the UK and abroad so book early! 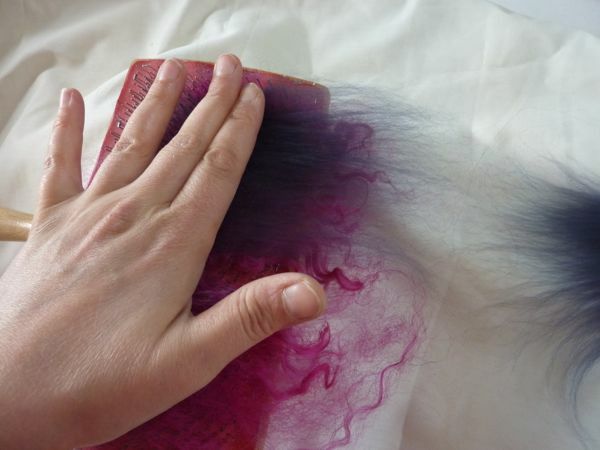 Amanda preceeded her Longdraw workshop with a general quick workshop on hand carding for all of the guild not just the workshop participants and finally I was able to make sense of the actually very simple process with her calm, clear teaching and I wondered why I’d made such a fuss about it for so long! 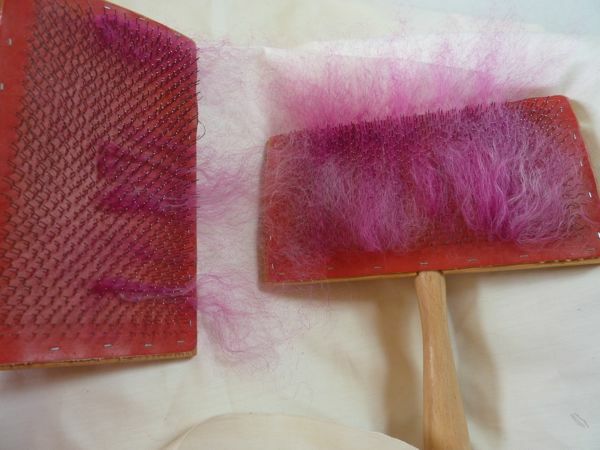 I still don’t generally hand card a lot but lately I’ve done quite a bit with the Hand Dyed Gotland I sell – I’ve found that Gotland cards into rolags beautifully which surprised me it’s classed as a long wool which you don’t normally card but comb. I’ve always approached Gotland in a worsted or semi worsted manner but woollen spinning it from rolags is now my favourite new way of prepping Gotland! 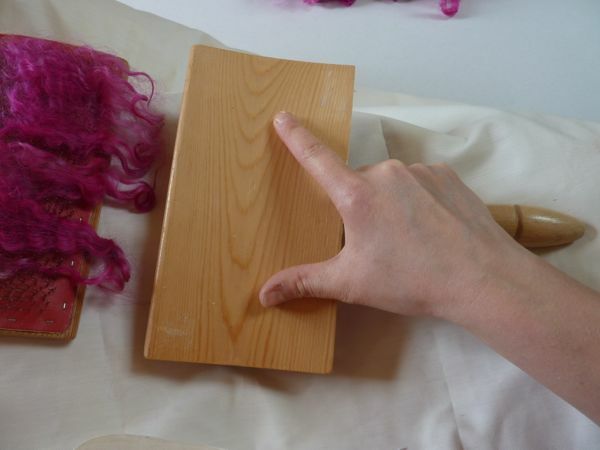 Hand cards come in different cloths – these ones are average 72points/teeth per inch (pip/tpi) and are good for most general carding and blending wool and other fibres. 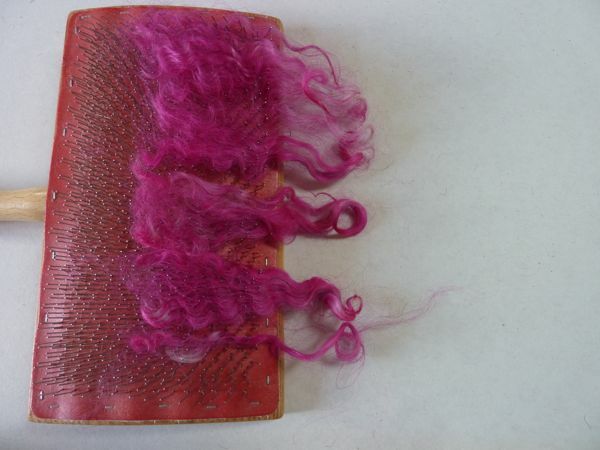 Finer cards can be used to card finer fibres and finest of all are cotton hand cards. It’s easier to card with a “broken in” set of carders where the teeth are more flexible but some makes of cards are nice and soft already. They range in price and if you intend to do a lot of carding then it pays to invest in a good pair but a sturdy set of second hand ones will probably be your best bet as the running in will already have been done. 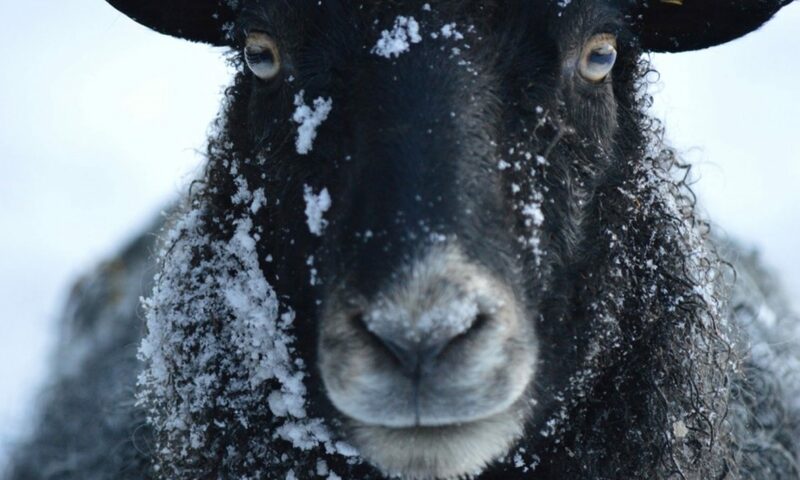 Choose wool that isn’t too long, 2-4 inches is manageable and gotland is a good wool to practice on providing the staple isn’t too long as it opens up easily and is also slightly “sticky” due to the nature of the fibre which helps to hold your rolag together whilst you get to grips with things. 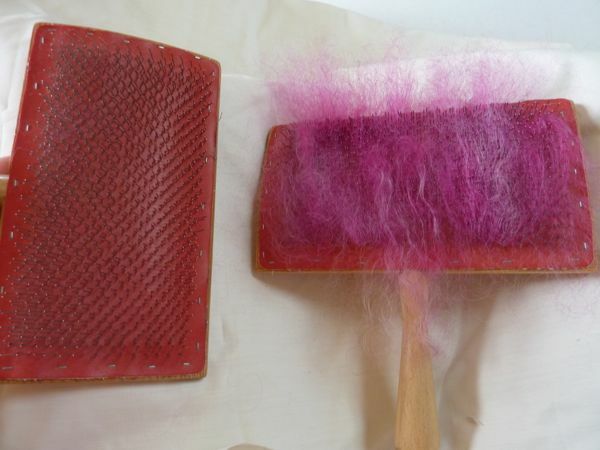 Start with washed wool, dyed or undyed doesn’t matter but you don’t want to card greasy wool. Tease out some locks and lay them on the carder in your left hand with the tips just dangling over the end and the butts about halfway up the carder. 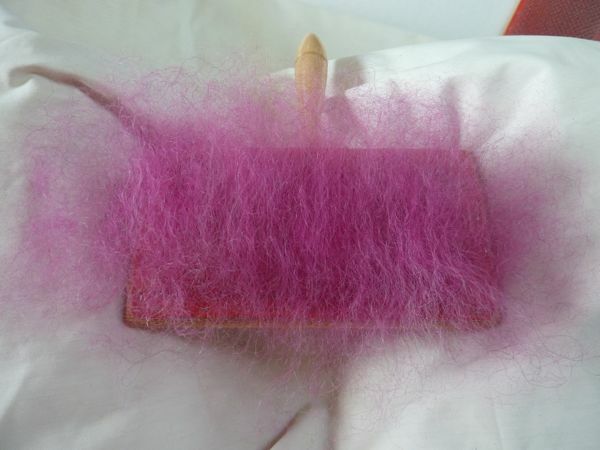 It’s better not to put too much wool on your carder, far easier to card and makes for a better carder. Less is always more with carding. 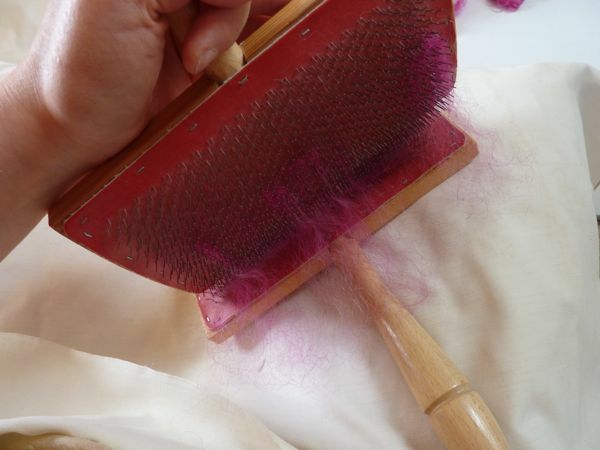 Just catch the tips of the wool with your right carder. 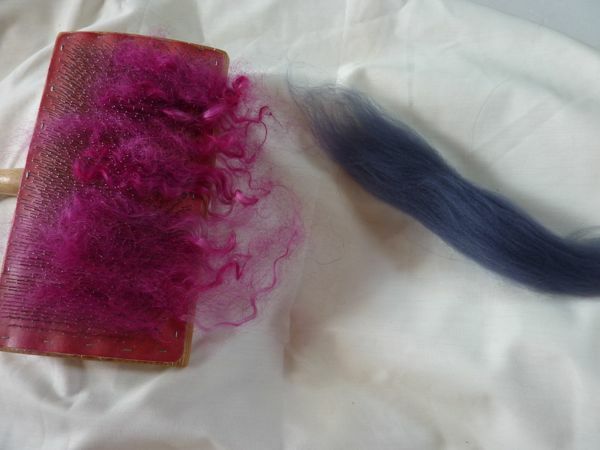 In a few strokes time most of the fibre will have moved from the left carder to the right and it will look something like this. Not all the fibre will have moved and that’s fine. Now you want to transfer the fibre back off the right carder on to the left one so we pick up the right card and place the tip of the right card against the heel of the left carder (that’s by the handle) with the teeth facing each other at an angle of 45 degrees and brush the right carder down and across the left carder. 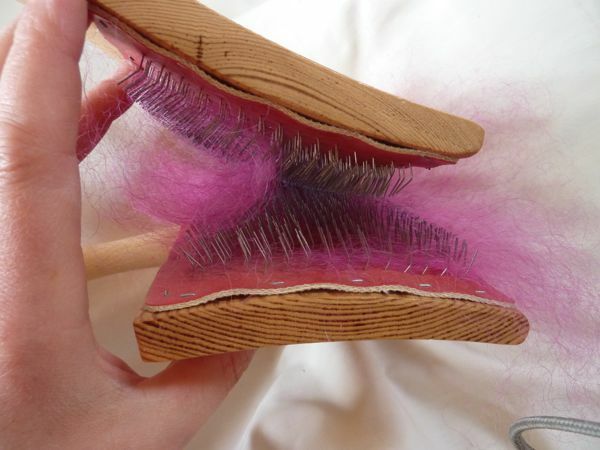 This will transfer the fibres cleanly in one move and leave them on the top of the teeth of the left carder. In this photo I’ve got the carder on the right but it was the left carder I promise!! Now begin the stroking again, right carder working on the loaded left carder and repeat the process until about half of the fibre is on each carder. 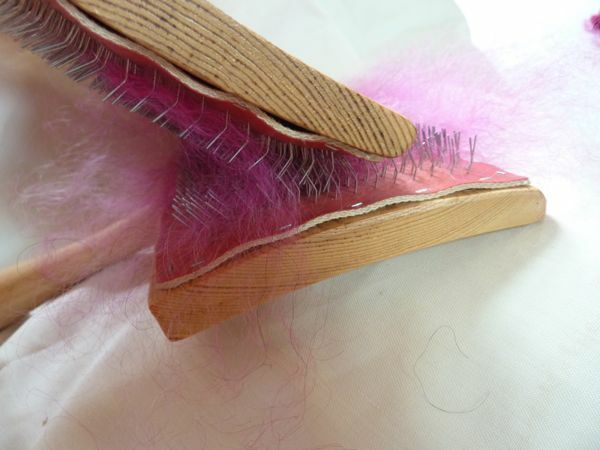 This time, put the tip of the left carder carder against the heel of the right at 45 degrees and push to remove the fibre as you did the first time the opposite way around. Card the fibre again. 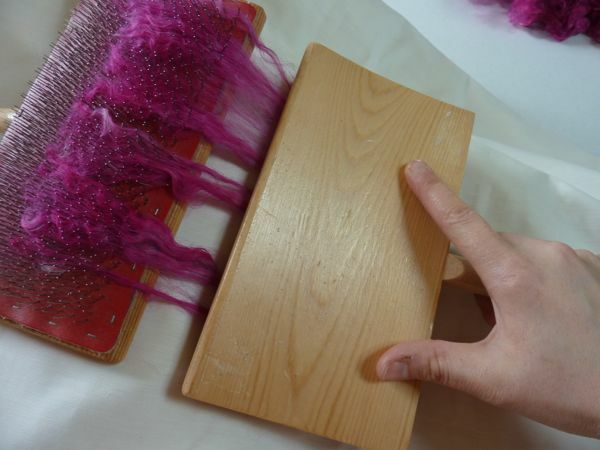 Have a look at the fibres. If they look carded well enough, no lumps of fibre and nice and evenly spread across the surface of the cards it’s time to remove it. If you think it could do with a bit more carding then repeat the carding sequence another time or two. 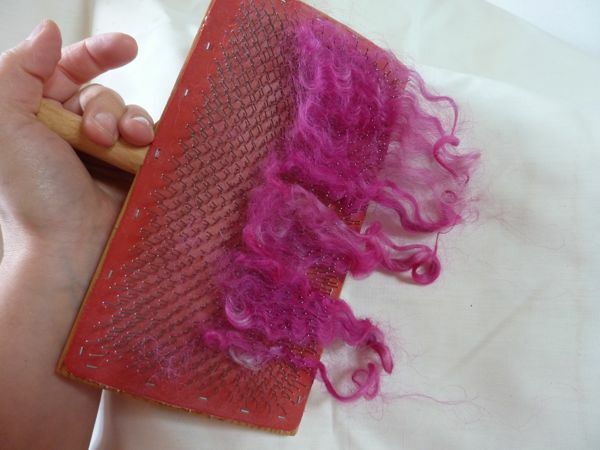 (sounds complicated but basically you are just removing the fibres from each card without carding in between and the small “batt” of all the fibres will now sit on the top of the teeth of the right carder. 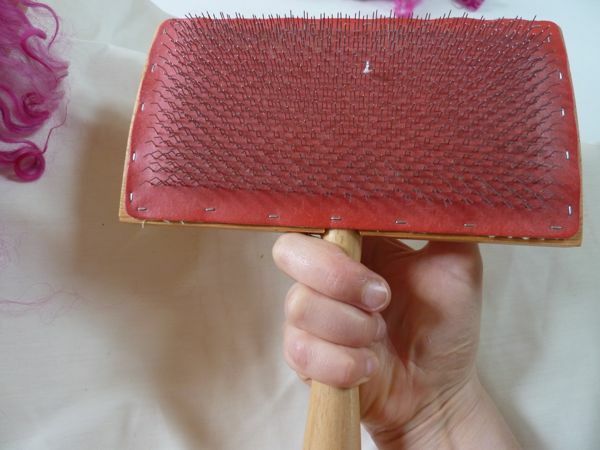 …and roll it back up again over the teeth away from you which will firm it up as the teeth “tuck” the fibres into the rolag more and neatens the rolag up and makes it easier to handle. Voila!! You have a rolag! 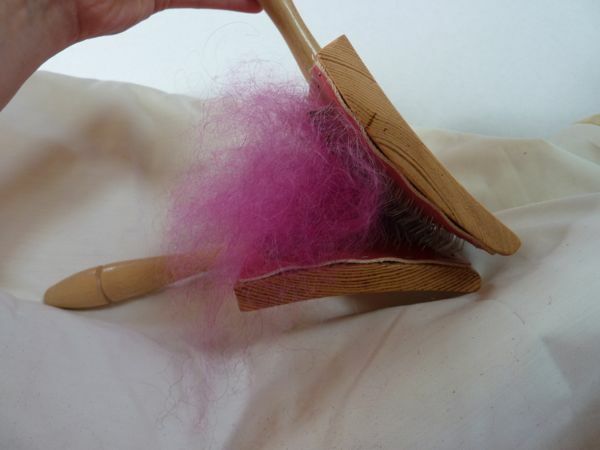 Repeat until you have a nice pile of fat little rolags to spin from – either you can lots and then just sit and spin or you can break up your actions but carding some and then spinning and then going back to carding. It might take longer but sometimes it’s a good thing to vary your actions so as not to put repetitive strain on your joints and muscles. 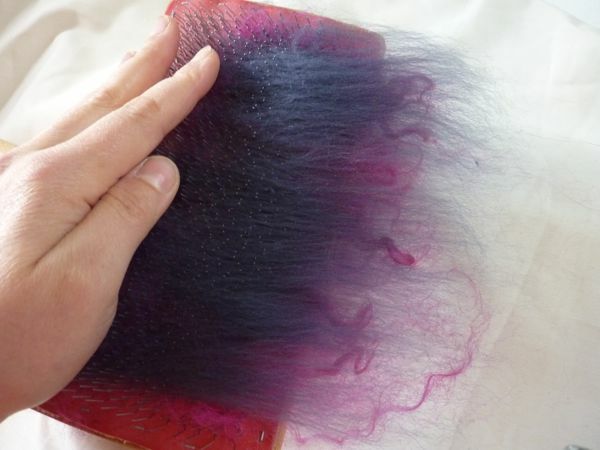 You can also easily blend fibres on your carder and here I will show an abbreviated version as you’re basically carding the same way as above, just adding more fibres at the beginning. 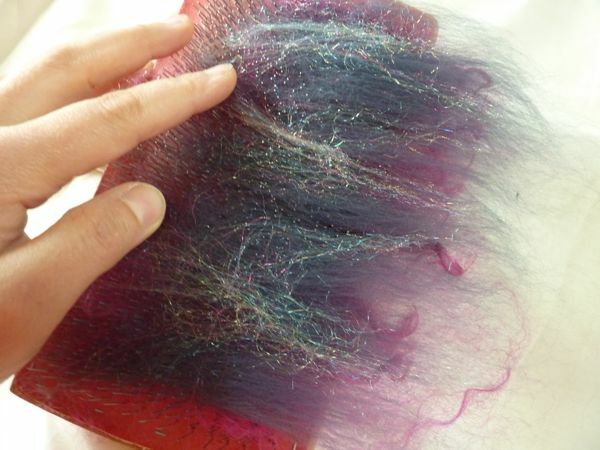 So, load you carder with the first fibre, remember, not too much otherwise it will be hard to card and blend and get a smooth result. 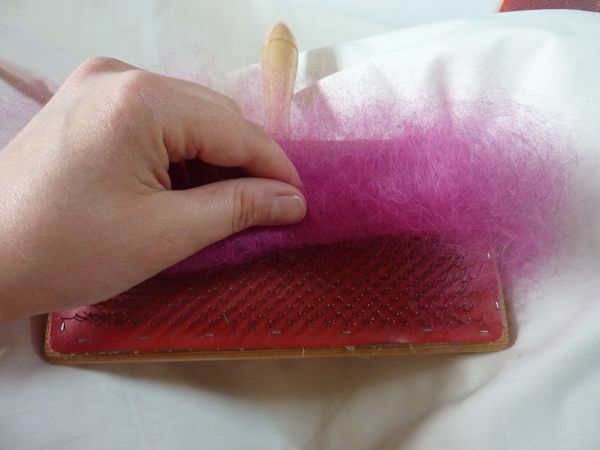 Place the tops on the carder over the other fibres and holding it down lightly with your left hand, pull on the tops with your right to leave a thin layer on top. 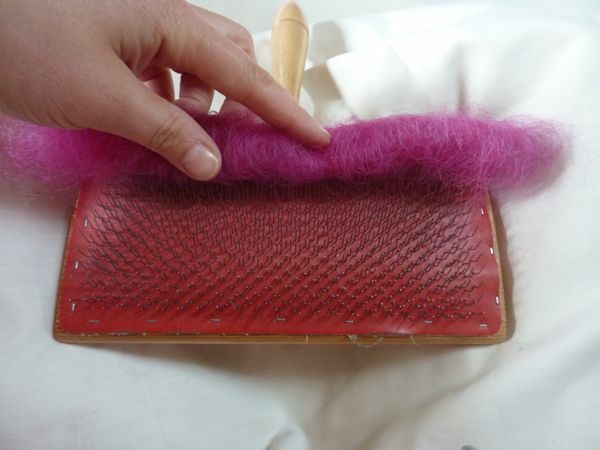 Repeat over the surface of the carder so a thin layer of merino covers it. 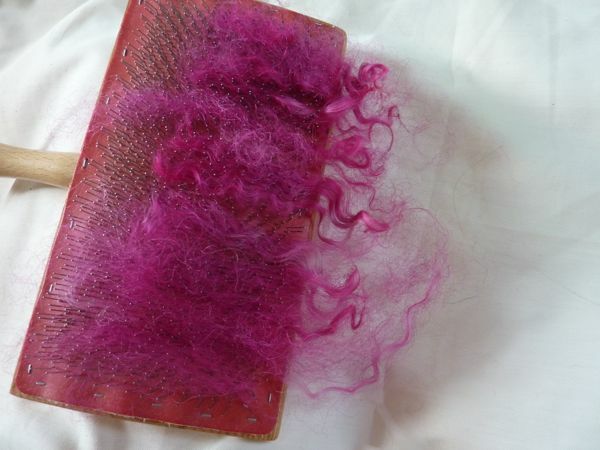 Here I’ve decided to add some bling with a bit of sparkly fibres – Firestar also known as Trilobal Nylon. A little goes a long way so go steady with applying this! 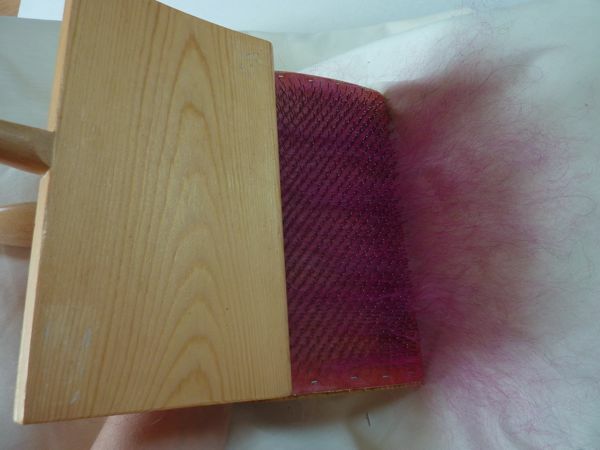 Go through the carding process until you end up with the fibres blended to your satisfaction, you might need to do a couple more passes than with the plain fleece if you want it completely mixed together as I’ve done here. 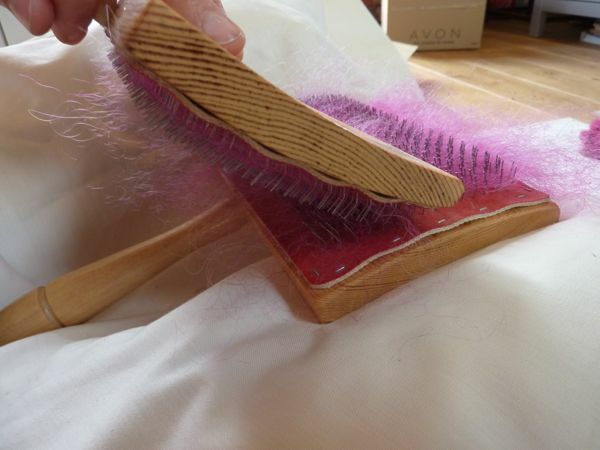 Roll up your rolag as before and admire your beautiful fibres! Previous PostPrevious Shop till you drop….